USES: This medication is used for temporary relief of congestion in the nose caused by various conditions including the common cold, sinusitis, hay fever, and allergies. It works by narrowing the blood vessels in the nose area, reducing swelling and congestion. OTHER USES: This section contains uses of this drug that are not listed in the approved professional labeling for the drug but that may be prescribed by your health care professional. Use this drug for a condition that is listed in this section only if it has been so prescribed by your health care professional. This drug may also be used to relieve "plugged ears" and to reduce swelling in the nose before certain surgery or procedures. HOW TO USE: Use this medication in the nose as directed. Follow all directions on the product package, or use as directed by your doctor. If you are uncertain about any of the information, consult your doctor or pharmacist. Gently blow your nose before using this drug. Use your finger to close the nostril on the side not receiving the medication. While keeping your head upright, place the spray tip into the open nostril. Spray the medication into the open nostril as you breathe in through your nose. Sniff hard a few times to be sure the medication reaches deep into the nose. Repeat these steps for the other nostril if needed. 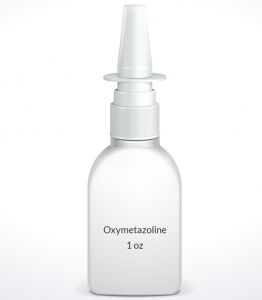 Avoid spraying the medication into your eyes or onto the middle of the inside of your nose (nasal septum). Rinse the spray tip with hot water or wipe with a clean tissue after each use. Make sure that water does not get inside the container. Replace cap after each use. This medication provides only temporary relief. Do not use more often, use more sprays, or use longer than directed because doing so may increase the risk of side effects. Also, do not use this medication for more than 3 days or it may cause a condition called rebound congestion. Symptoms of rebound congestion include long-term redness and swelling inside the nose and increased runny nose. If this occurs, stop using this medication and consult your doctor or pharmacist. Inform your doctor if your condition worsens or persists after 3 days. SIDE EFFECTS: Temporary burning, stinging, dryness in the nose, runny nose, and sneezing may occur. If any of these effects persist or worsen, tell your doctor or pharmacist promptly. If your doctor has prescribed this medication, remember that he or she has judged that the benefit to you is greater than the risk of side effects. Many people using this medication do not have serious side effects. Tell your doctor immediately if any of these unlikely but serious side effects occur: slow/fast/pounding heartbeat, dizziness, nausea, headache, mental/mood changes, trouble sleeping, shaking (tremors), unusual sweating, unusual weakness. A very serious allergic reaction to this drug is rare. However, seek immediate medical attention if you notice any symptoms of a serious allergic reaction, including: rash, itching/swelling (especially of the face/tongue/throat), severe dizziness, trouble breathing. This is not a complete list of possible side effects. If you notice other effects not listed above, contact your doctor or pharmacist. In the US - Call your doctor for medical advice about side effects. You may report side effects to FDA at 1-800-FDA-1088. In Canada - Call your doctor for medical advice about side effects. You may report side effects to Health Canada at 1-866-234-2345. PRECAUTIONS: Before using this nasal decongestant, tell your doctor or pharmacist if you are allergic to it; or to other sympathomimetics (e.g., pseudoephedrine); or if you have any other allergies. This product may contain inactive ingredients, which can cause allergic reactions or other problems. Talk to your pharmacist for more details. If you have any of the following health problems, consult your doctor or pharmacist before using this product: heart/blood vessel disease, overactive thyroid (hyperthyroidism), diabetes, high blood pressure, difficulty urinating (due to enlarged prostate). Before having surgery, tell your doctor or dentist that you are using this medication. Caution is advised when using this drug in children because they may be more sensitive to the effects of the drug. Check the product package or consult with your doctor or pharmacist about whether this nasal spray can be used in children. During pregnancy, this medication should be used only when clearly needed. Discuss the risks and benefits with your doctor. It is not known whether this drug passes into breast milk. Consult your doctor before breast-feeding. DRUG INTERACTIONS: If you are taking this product under your doctor's direction, your doctor or pharmacist may already be aware of any possible drug interactions and may be monitoring you for them. Do not start, stop, or change the dosage of any medicine before checking with your doctor or pharmacist first. Avoid taking MAO inhibitors (isocarboxazid, linezolid, methylene blue, moclobemide, phenelzine, procarbazine, rasagiline, selegiline, tranylcypromine) within 2 weeks before, during, and after treatment with this medication. If you are currently using any of these medications listed above, tell your doctor or pharmacist before starting the nasal decongestant. Before using this medication, tell your doctor or pharmacist of all prescription and nonprescription/herbal products you may use, especially of: high blood pressure medications (e.g., reserpine, guanethidine), tricyclic antidepressants (e.g., amitriptyline). Check the labels on all your medicines (e.g., cough-and-cold products) because they may contain decongestants or ingredients that could increase your heart rate or blood pressure. Ask your pharmacist about using those products safely. This document does not contain all possible interactions. Therefore, before using this product, tell your doctor or pharmacist of all the products you use. Keep a list of all your medications with you, and share the list with your doctor and pharmacist. OVERDOSE: This medicine may be harmful if swallowed. If swallowing or overdose is suspected, contact your local poison control center or emergency room immediately. US residents should call the US National Poison Hotline at 1-800-222-1222. Canada residents should call a provincial poison control center. Symptoms of overdose may include: drowsiness, slow heartbeat, dizziness, fainting. NOTES: Do not share this medication with others. Use of this container by more than one person may spread infection. There are various nasal decongestants available, many without a prescription. Talk with your doctor or pharmacist about which product is best for you. STORAGE: Refer to storage information printed on the package. Protect from heat and light. Keep all medicines away from children and pets. Do not flush medications down the toilet or pour them into a drain unless instructed to do so. Properly discard this product when it is expired or no longer needed. Consult your pharmacist or local waste disposal company for more details about how to safely discard your product.